In Northern Europe, tapestries were prized and costly works of art. Used to decorate walls in both religious and secular spaces, large tapestries served much the same function as fresco paintings in Italy and Spain. 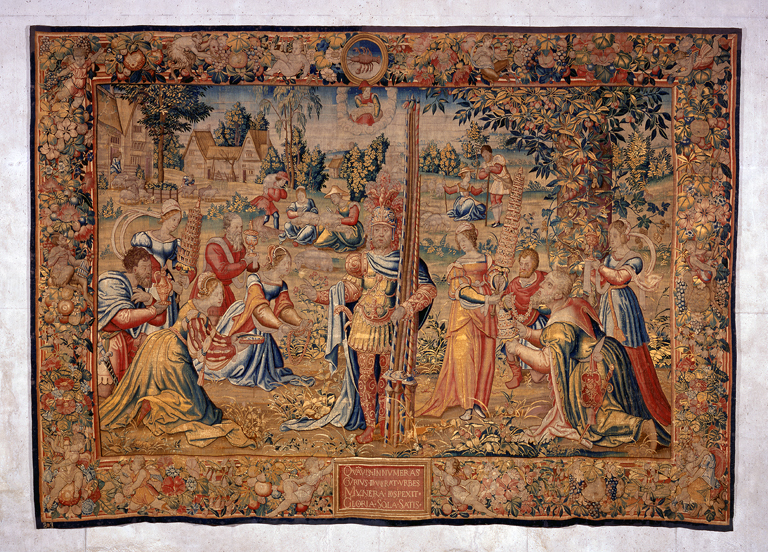 This example comes from a workshop in the great Renaissance center for Flemish tapestry Brabant-Brussels. The central figure is identified as the third-century BC Roman general Manius Curius Dentatus. Clad in Roman-inspired ceremonial armor, he stares resolutely ahead, pleased with his army’s defeat of the Samnites. The general’s refusal to accept the victories of war earned Dentatus a reputation for justice and incorruptibility. The story would have appealed to Renaissance princes. Andera, Margaret, Nonie Gadsden, Britt Salvesen, and Laurie Winters. Collection Guide: Milwaukee Art Museum. Milwaukee, Wisconsin: Milwaukee Art Museum, 2004, pp. 10 and 67, cat. 5, color illus. p. 10. Milwaukee Art Museum. Building a Masterpiece: Milwaukee Art Museum. New York: Hudson Hill Press, 2001, p. 61, color illus p. 42 and 61. Milwaukee Sentinel, September 18, 1958, cover. Hops Step up Interest in Tapestry, Milwaukee Sentinel, September 12, 1954, Profile section, p.1 and 4. Milwaukee Sentinel, March 30, 1954. Milwaukee Journal, March 28, 1954, b/w illus.